Beta Beta Beta Graduation Cords are Forest Green and Red and are worn with cap and gown at graduation ceremonies by members of the National Biological Honor Society Beta Beta Beta. The Honor Cord is a double cord, which means that it is made up of two cords tied together in the middle with an overhand knot. 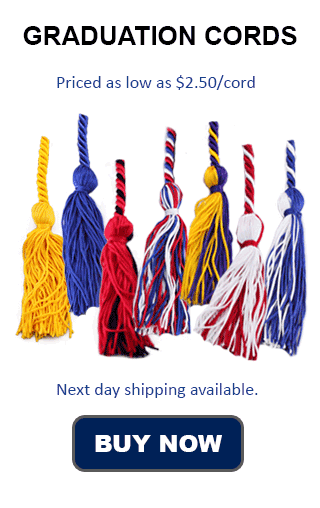 Though the Beta Beta Beta website does have honor cords available, we promise fast shipping at a flat rate of only $4.00. While the society cords take up to 3 weeks before they are even shipped, at Honors Graduation, we put your order in the mail as soon as we recieve it, making sure you get your cords when you need them. Each cord is approximately 62 inches in the middle with 4 inch tassels at each end. The cord itself is approximately ¼ of an inch in diameter. Beta Beta Beta is also known as TriBeta, and their honor cords are Forest Green and Red because those are their colors. The motto of Beta Beta Beta is "Blepein Basin Biou," which means "To See the Foundation of Life." Founded in 1922 at Oklahoma City University (the Alpha Chapter) the academic fraternity now has over 553 chapters and has published a Journal, BIOS, since 1930. BIOS feature undergraduate papers based on their research. In addition to the original Oklahoma City University Chapter, there are chapters at the University of Toledo, Baylor University, Northern Arizona University, Arkansas State University, and the University of Northern Iowa among others. The Tri Beta coat of arms features a skull and a snake, leaves, a bird and a fish, four acorns, and a knights helmet. The fish, the bird and the acorn represent life in the air, the ground and in the water. The Beta Beta Beta coat of arms also prominently displays the Honor Society's colors, green and red. Red is for zoology (blood/life) and green is for botany. These ideas are also present in the graduation honor cords that are presented to each graduating student in the collegiate honor society.